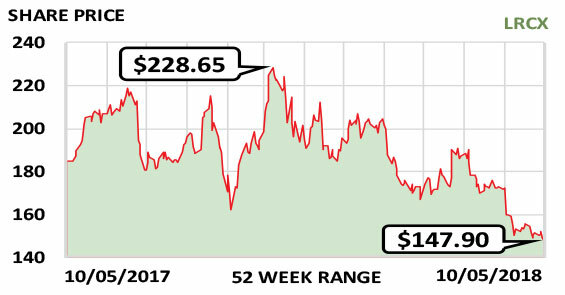 This week’s Stock of the Week has been hurt because of industrywide fears, but it’s a strong company with potential. Lam Research Corporation (LRCX) designs, manufactures, markets, refurbishes and services the semiconductor-processing equipment that makes integrated circuits. With the growing demand for faster and more capable chips and the nearly insatiable worldwide need for data processing, the company seems like a natural investment choice. But the semiconductor industry is notoriously cyclical, and investors have recently become concerned about an industrywide slowdown that will likely reduce Lam’s earnings by 15% over the next fiscal year. The worry is misplaced. Lam is cash-rich, with an excellent balance sheet—and has been buying back its own stock as the price has fallen. Earnings will still be very high and should resume their growth the following year. Lam also pays a generous dividend of $4.40/share/yr., recently yielding 2.9%, which appears secure. Revenue was $11.1 billion in fiscal 2018 and likely will be $10.5 billion in fiscal 2019 and $11.6 billion in fiscal 2020. Fiscal year: June. Earnings per share: 2020 est./$18.43…2019 est./$15.79…2018/$18.41.